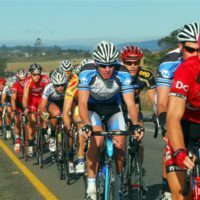 Tsogo Sun Amashova’s Corporate Challenge looks to get cyclists cruising! Enter the Tsogo Sun Amashova Durban Classic’s Corporate Challenge and you could be sailing into the setting sun on the luxurious Spirit of eLan. The Corporate Challenge provides corporates with the chance to compete as a group while building camaraderie amongst employees. “The Corporate Challenge is a great team and brand building opportunity for all businesses with a distance to suit all experience levels. We already have big hitters such as ABSA, Cipla Medpro, FLSmidth and Afrimat Aggregates KZN signing up staff to represent them in the race. We encourage all other corporates to embrace the Spirit of Amashova and get involved by entering a team,” says race organiser, Annie Batchelder. Annie Batchelder (left) discussing updates with David Yapp (right) to this year’s race – including the exciting revamped Corporate Challenge and new Avis point to point offering. The group entry package includes an early start time and a special registration area for race pack collection. Contenders in the 106km race will have the chance to win a two-hour sunset cruise for 20 people on the luxurious Spirit of eLan catamaran. Entries cost R680 per person for the 106km race, R450 per person for the 65km race and R320 per person for the 35km fun ride. This excludes the RaceTec timing chip. A minimum of five non-existing new entries are required to enter a team. “For those individuals who have already entered, we can convert existing entries into group entries over and above the five new entries submitted so they can still be included in the Corporate Challenge,” explains Batchelder. The top five fastest times will be combined to calculate the groups’ finishing time and the winning Corporate Team from this bunch will be announced the week after the race in October. The cut-off date for payment and adding new riders to a group is Thursday, September 21. Please email queries@cycleevents.co.za to secure your group indicating how many entries you’d like. For more information on the Tsogo Sun Amashova Classic go to www.shova.co.za. Entries are already open and the closing date for online entries is the 21 st of September at 23:00.